Walking out onto the patio where Wired Café took place in San Diego in stone-throwing distance of San Diego Comic Con, one is embraced by not only the warm and sunny, yet delightfully breezy weather, but also a delectably enjoyable aural soundscape of music and conversations. Going further out into the crowds, one encounters various foods and drinks, as well as a Ben & Jerry’s tent serving ice cream for adults. Amongst it all, one is surrounded by interesting people, whether press, in the entertainment industry, or other walks of life. 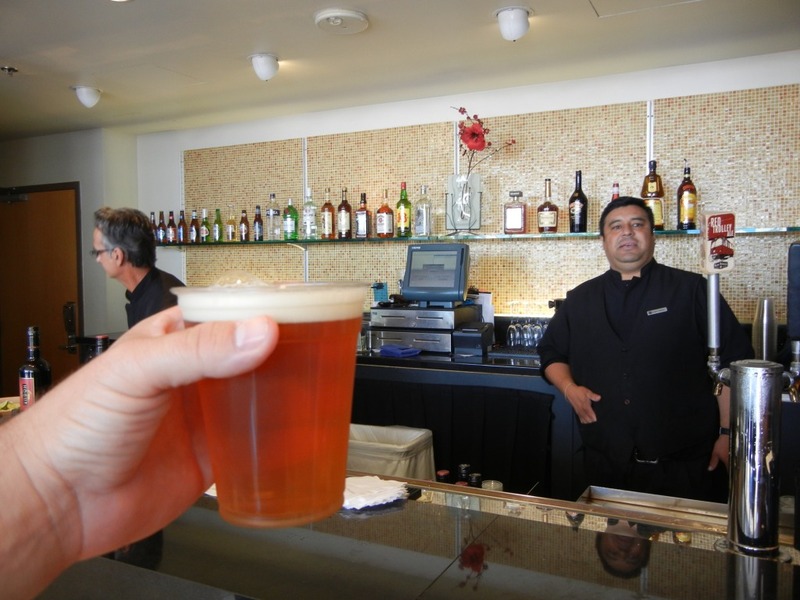 Taking place on the patio on the sixth floor of the Omni Hotel in downtown San Diego, yesterday’s Wired Café served up a very cool atmosphere away from the hordes of San Diego Comic Con. Lasting from 11am-7pm, the event began with lovely sunny, yet warm weather, giving way to a comfortable shade later in the afternoon. With simplistic, yet effective signage pointing to Wired’s cool daytime party, one also was quite aware of Wired’s convening this cool daytime party with dozens of copies of the newest Wired issue featuring Rashida Jones on its cover sprinkled about. 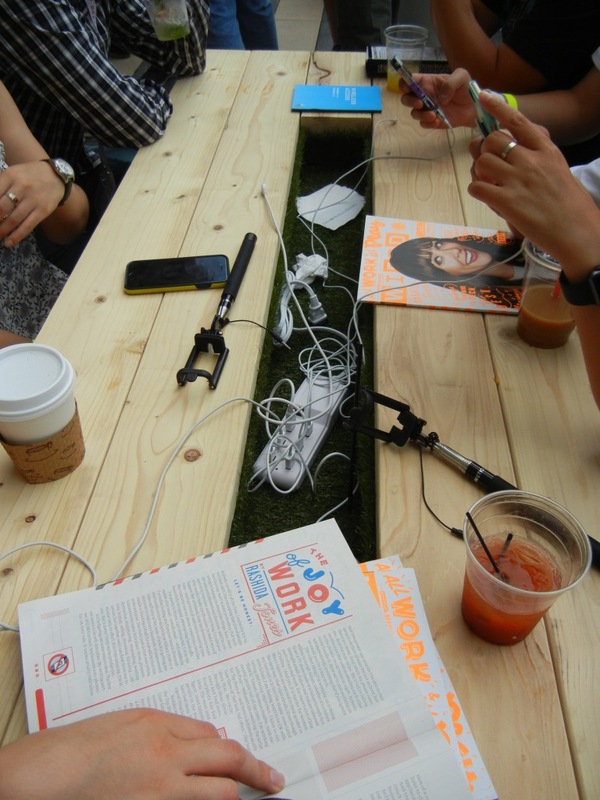 Appropriate for a Wired event, there were two companies demonstrating their products, offering free samples. 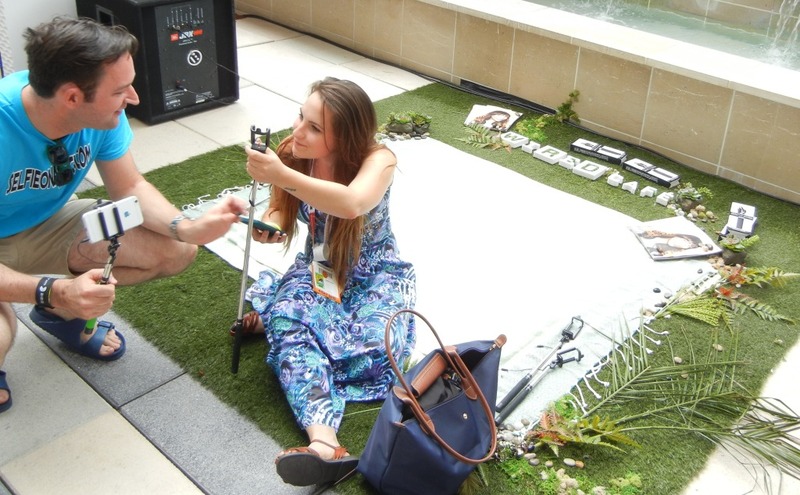 One, Epilog Laser, was showing off one of their etching printers, allowing attendees to have a design of their choice etched onto either one’s mobile device or a complimentary bottle opener, while the other, Selfie On A Stick, was demonstrating their selfie stick. While attendees early on could get free samples of the product, they stopped giving them out until the end of the event, when they distributed all of the rest of them. There were also two virtual reality products to try out, as well: Leap Motion Controller and Catatonic. In addition to the technology products, there was a lot of free food and beverages. 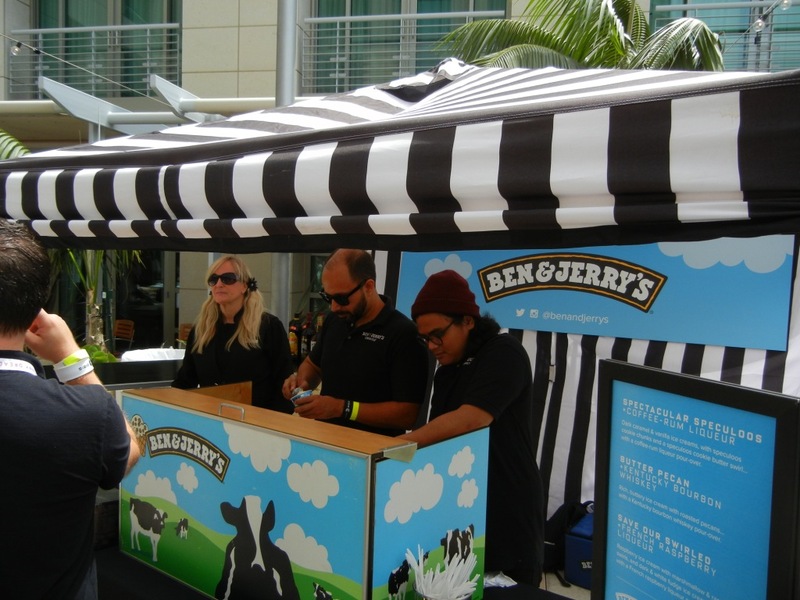 In addition to donuts, sandwiches, and other hors d’oeuvres, Ben & Jerry’s had a tent set up in a corner, allowing attendees to sample a few different ice creams with liquor poured onto them, pairing their Spectacular Speculoos with coffee-rum liqueur, their Butter Pecan with bourbon whiskey, or Save Our Swirled with French raspberry liqueur. As a bourbon fan, I went with the bourbon and Butter Pecan, which as good, although it was quite boozy. There were also two bars set up, with one outside with modest offerings and another bar inside, with a standard bar, offering four different beers (Karl Strauss Red Trolley Ale, Stone Imperial Pale Ale, Groundswell Tropical Hefeweizen, and Groundswell Pale Ale), and a variety of drinks, but a specialty drink offered was the dragon berry mojito, which was an appropriately light cocktail on a summer day. The music played for the first few hours by DJ Artistic was an appropriately upbeat, yet laid back combination of hip-hop instrumentals mashed up alongside jazz, which then gave way in the last few hours to Tramlife‘s playing of a lot of hip-hop songs, for a more upbeat atmosphere as the party went along. The music was a fantastic background for the conversations taking place. 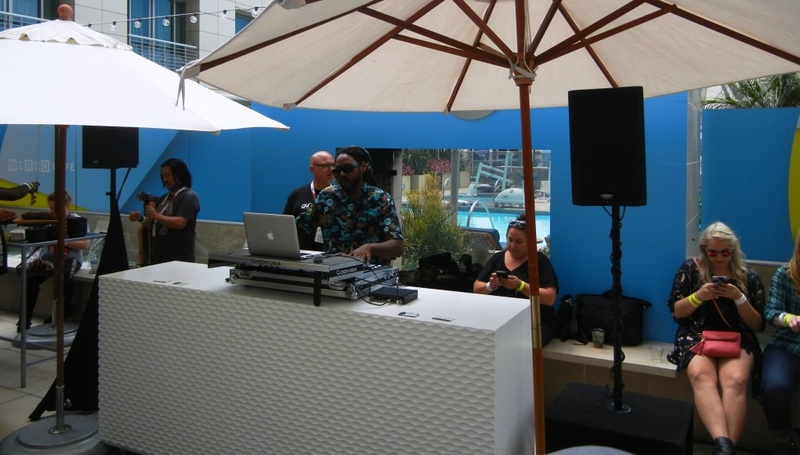 Whether people were waiting in line for the etching services of Epilog Laser, sitting down at one of the benches for charging mobile devices, on the couches, or just milling about, the music provided an excellent backdrop of sound for the party. It was a great event enjoyed by many and it was great to get to experience it!